The title of this book grabbed you like it did me. Just like a stranger grabbing you by your collar — the result is instant attention. In She Hands Me The Razor Richard Krawiec grabs our full attention. This is an almost perfect poem. The tension is palpable, so is the tenderness, grace and finally, beauty. All in a short narrative. Krawiec has published two novels, a book of stories, four plays and a poetry chapbook. She Hands Me The Razor is a formidable first collection. Fred Chappell, former Poet Laureate of North Carolina, author of Shadow Box: Poems described She Hands Me The Razor as "powerful experiences powerfully rendered with an art that seems almost casual." And he is right, there is a casualness to the language, the ease with which Krawiec bends us to his will, to his way of seeing. But there is nothing casual about the hard edge of the reality Krawiec explores in many of these poems. The blinding tragedy of a death in a family is brought full circle in these poems. Very intimate and harrowing and all the more so because they speak in a language we all know, recognize. Powerful stuff indeed. "Seems almost casual". There's the rub. There are few things harder than appearing natural at something that is difficult, writing a poem that is natural sounding but still full of poetic tension, suspense. Richard Krawiec comes out of the gate swinging again and again - quick poems about life, loss, love, longing - all that contemporary human condition manifesto stuff. 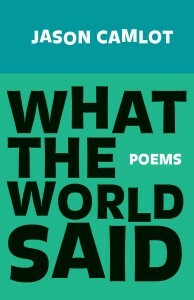 But Krawiec is never after the gloss, these poems are an honest look at the flaws we abound in despite our best efforts. Krawiec is head on heart-breaking with some of these very human poems about death and dying. She Hands Me The Razor is an ode to intimacy. Messy, painful and redemptive human intimacy. And it is a strong helping. Video: Richard Krawiec reads Joseph Bathanti. Today's book of poetry: Utter. Vahni Capildeo. Peepal Tree Press. Leeds, England. 2013. Vahni Capildeo's Utter is poetry two cultures removed from my own and yet it speaks to me with a vibrancy as taut as the strings of violin. Capildeo is a chameleon in these pages. Utter shows a full range of poetic styles and a writer in full control of a rather limitless voice. These carefully constructed poems are as delicate as a heavy man navigating thin ice, as confident as the fox slinking away with the cackling bird in its' maw. one to love, meddled too with chocolate prints from a baby past. I would be stuck with that. by whom I am not seen. The multifarious integrity of pomegranates. Sharing a hell with you no king and I almost queen. From poem to poem in this collection there is a consistent tone, an ongoing level of discourse that is captivating - but it comes from any of the myriad of voices Capildeo has captured. Each voice has its' own distinct rhythm, texture, pulse. Each of Capildeo's voices understands that it all comes at a cost, whatever voice holds forth, another is suppressed. There is plenty of humour in Utter, it just always comes at a cost. bring a fresh perspective to criticism. People would appreciate that. is that your book? I'm afraid I don't read much contemporary poetry. my brown corduroy trousers for tomorrow). Sorry. There isn't necessarily any justice in Vahni Capildeo's poetic world, these poems reflect the realities of a corrupt and cynical world. The sea needs no ornament. and is herself our wreckage. forever lying off the coast. The railroad makes straight the house. No names for you pass muster. I wrote gods' names in the sand. Vahni Capildeo was born in Port of Spain, Trinidad and currently lives in London, England. Capildeo is the author of four previous poetry titles, No Traveller Returns (2003), Person Animal Figure (2005), Undraining Sea (2009), and Dark & Unaccustomed Words (2012). First I tried to hide it from itself. The I tried to hide it from myself. even when we knew that was no use. nesting near the coastlines of your palm. Vahni Capildeo's fifth book of poetry is a mature work for serious readers of poetry and it is full of abundant rewards. Trinidad to London to Ottawa is a long reach for a book of poetry. Very glad to meet the most loquacious Vahni Capildeo. Today's book of poetry: Winter. Patricia Farngnoli. The Hobblebush Granite State Poetry Series, Volume VI. Hobblebush Books. Brooklyn, New Hampshire. 2013. The legendary cellist Pablo Casals was asked why he continued to practice at age 90. "Because I think I'm making progress." he replied. I'm thinking this applies to the elegant poetry of Patricia Fargnoli. Fargnoli, a former New Hampshire Poet Laureate, shows us some of the characteristics of the senior artist whose has seen it, tried it, out-lived it, and now has that considered voice of experience. Fargnoli has learned to separate the wheat from the chaff and winnowed to the essential grain, where the nourishment lay. and know if for its transience. These languid poems seemingly roll off of Fargnoli's effortless tongue but I'm certain the Pablo Casals motto holds true. How do you get to Carnegie Hall? Practice, practice, practice. Winter, Patricia Fargnoli's fourth book of poetry, has a gentle forcefulness behind every line. You can call it wisdom or experience, I'm going to call it the reader's luck. Fargnoli talks to us about "the quiet things that are". Neddie his name is, old now and ill.
Who among us becomes what we set out to be? as if she had just put it away and taken up this other. as a nun praying. The background, only a beige wall, nothing else. Do the words of the valuable book enter her mind and change her? Does she grow into the woman the artist later becomes? how she died overshadowed, unrecognized? in her hands. We give our hearts to her, don't we? when the future can't touch her. Time and time again as I read these pages — I wanted to share more poems. Is it too trite for me to say these are sage wisdom stuff? Well, it's been said. Fargnoli hits the right note time and again, whether she is asking the much needed question or providing resolution. These quiet, understated and very powerful poems resonated with me. Winter addresses questions of our mortality, our morality, big question stuff, but it is never in your face, the quiet timing of Fargnoli's approach, giving voice to the essential little questions as well, somehow it is the voice of something weathered, but still strong and dependable. her vestige back to me. In the end, I couldn't get enough of Patricia's Fargnoli's Winter. I liked the pace of these poems, the politic of these poems, the mature love of poetry in these poems. Patricia Fargnoli reading "Wherever You Are Going"
As I am the one and only editor/writer, mad person at the helm of this blog I feel it is important to be clear about some of my biases. I believe Tom Wayman is a national treasure. I've never had the privilege of meeting him but the measly five books of his I am lucky enough to own: For and Against the Moon (1974), Money and Rain (1975), a planet mostly sea (1979), The Noble Prize Acceptance Speech (1981) and Counting the Hours (1983) have cemented Wayman in my mind as a particularly rare bird in Canadian poetry. One that is desperately needed. While the rest of us dance pretty around the edge of things Wayman takes a laser look at our society and the needs of the working class, his constant surveillance a guiding light. community or nation needing to seek out armed combat..."
or trailered boat in its yard. out between these valley walls. Wayman has been awarded the Canadian Author's Association medal for poetry and the A.J.M. Smith Prize for distinguished achievement in Canadian poetry. He has numerous awards but if I were giving them out he'd have a lot more. Dirty Snow is Tom Wayman's eighteenth book of poetry and it is as vibrant as number one and as relevant as anything else out there. Yet, to this reader, Wayman is too frequently dismissed because of the urgency and sometimes pleading tone of the political discourse he insists on conducting, that he insists on for our behalf. most recent case, when the last Canadian soldier leaves foreign soil..."
Shreds of maple, hardened blood. Ash sifted across meadow, stream bank, road. Stems and serifs of numbers perceptible on the largest shards. Mounds of detritus will linger if this snow melts. Here is a poet who has been a genuine voice of the people since he slammed out of the gate in 1973 with Waiting for Wayman. These narrative poems, hard-edged realist poems, straightforward and driving as always, concern themselves with the ramifications of Canada's involvement in the Afghan War. As always, Wayman is asking the important questions. His books should be read in Parliament before those big cats get to debate. Wayman's passionate voice continues to be a clarion call. In Dirty Snow some of the poems are prefaced with a brief prose introduction - but the clarity of these poems is self evident. despite existing also in a fourth. but he was looking for the soul. I'm fairly certain Al Purdy and Milton Acorn would be standing proud after reading these poems. For me there is no more Canadian poet than Tom Wayman, now wouldn't he make a great poet laureate. Dirty Snow won the 2013 Acorn-Plantos Award.